Serena Williams has done it. She defeated Angelique Kerber of Germany to secure her 7th Wimbledon title and tie Steffi Graf's all-time Grand Slam record. Williams now holds 22 Grand Slam wins. Williams overpowered Kerber in straight sets, 7-5, 6-3. The pair will be ranked No. 1 (Williams) and No. 2 (Kerber) when the Women's Tennis Association releases new standings next week. The specter of Graf's record has hung over Williams in every match she's played since her last major win at Wimbledon in 2015. She says she appreciates the journey to winning the record. "It makes it even sweeter to know how hard I worked for it." Kerber and Williams have history. She upset Williams when they met at the Australian Open final earlier this year. Williams turns 35 in September, and her playing career is nearly unprecedented. For the past 178 weeks, Williams has been ranked No. 1 in the world, the longest such streak of her career. 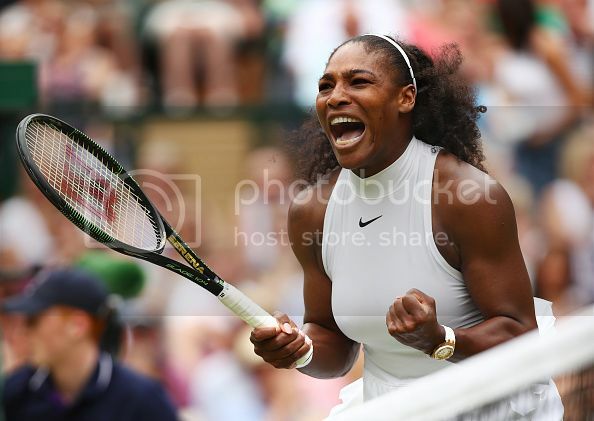 This historic win comes nearly 17 years after she won her first major tennis tournament, the U.S. Open, in 1999. After her win, Serena reflected on how the experience of winning on the world stage has changed as she's gotten older. "I feel like when you're younger you're obviously super excited and get really nervous," she said. "When you're older, you kinda have to win and you get used to winning. When you taste something you want it again and again and again. It's kind of addicting." Her dominance has put her in the top echelons of tennis stars. "Serena is the greatest player we've ever seen," said ESPN commentator Chrissie Evert, who holds 18 Grand Slam tennis titles, after the match. She will appear again on Centre Court to play in the doubles final with her sister, Venus, against Hungary’s Timea Babos and Kazakhstan’s Yaroslava Shvedova. Williams is ready to conquer. "I'm totally ready, she explained. "Obviously I want to get a title for V."